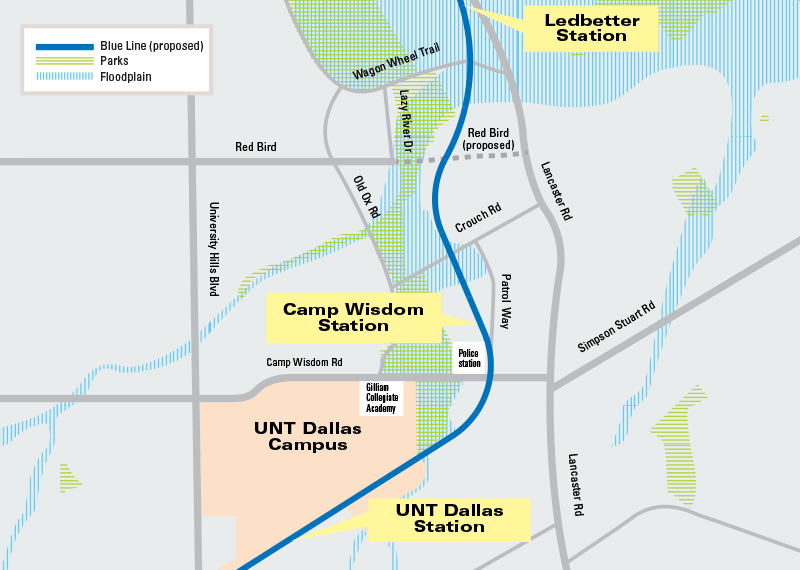 The South Oak Cliff Blue Line Extension (SOC-3) extends the Blue Line south approximately 2.6 miles from Ledbetter Station toward the University of North Texas (UNT) Dallas Campus located at the southeast corner of Camp Wisdom Road and University Hills Blvd. (formerly Houston School Road) and added two new stations. The extension provides potential development opportunities in the area south of Ledbetter Station to the UNT Dallas Campus. The line generally runs along the east side of Runyon Creek, crosses over Crouch Road west of the Magnolia Trace Senior Housing, crosses over a knoll north of the police station (South Central Patrol Division), follows Patrol Way east of the police station, then turns southwest toward the UNT Dallas campus. The alignment is aerial over Wagon Wheels Road, aerial over Crouch Road, at-grade over the knoll north of the police station, aerial following along the western boundary of Patrol Way adjacent to the police station, aerial over Camp Wisdom Road, cross Runyon Springs Creek on aerial structure, and operates at-grade along the southern boundary of the UNT Dallas campus. The Camp Wisdom Station is located at-grade on a knoll north of the police station on the west side of Patrol Way with bus access off Patrol Way. The UNT Dallas Station is located at-grade on the southern boundary of the campus near University Hills Boulevard. Bus access, kiss & ride access, general parking, and handicap parking is provided at both stations. A groundbreaking was held October 6, 2014 and the stations opened on October 24, 2016. The Final Local Environmental Assessment (EA) is complete as of May 2013. The Draft Local EA was available for review during a 30-day comment period October 1 to October 31, 2012. The Final Local EA documents the transportation and environmental impacts associated with the construction and operation of the South Oak Cliff (SOC-3) Blue Line Extension as compared to a No-Build Alternative. A broad range of environmental categories were assessed. Comments received on the Draft Local EA are addressed in the Final EA. The Final EA also includes the Mitigation Monitoring Program to ensure that any mitigation is incorporated into the project during final design and construction. Preliminary Engineering/Environmental Assessment was initiated in February 2012. The 5% preliminary engineering design is complete and a Draft Local Environmental Assessment (EA) is available for review (see above). The Alternatives Analysis study for the South Oak Cliff (SOC-3) Blue Line extension from Ledbetter Station to the University of North Texas (UNT) at Dallas is complete. On January 24, 2012 (Resolution 120006) the DART Board of Directors approved the recommended Locally Preferred Alternative (LPA) Alternative 2C.